This is why you should not start lying in court because then you have to continue lying to make yourself look truthful. Pirone’s lying caught up with him during Alameda County Deputy District Attorney David Stein’s hour of cross-examination. “I didn’t see the hands, so I didn’t see a threat. It didn’t pose a threat to me or any other officer,” Pirone, who was the commanding officer, said of the position Oscar Grant was in when Mehserle murdered him. It is difficult to imagine terrorist Mehserle escaping murder charges not only with this testimony, but also the obvious happenings of the night seen in numerous videos. But this is the USA, where thug cops are heroes. A decision should come in the next week, as to whether Mehserle will face murder charges at trial. So my question would be: if Mehserle thought Mr. Grant was going for a gun, why was he going for his Taser, as his lawyers have been saying? Do cops grab for their Taser when someone is going for a gun? Not likely. It would be a tragic, yet expected injustice if this murderer, Mehserle, somehow escapes murder charges. I assume this preliminary hearing will conclude this week, so we’ll know by Friday. Jon Woffinden, terrorist Mehserle’s partner, testified he was “more scared than he’s ever been” yet never pressed the emergency back-up button to summons help to the station. Watch the report from KRON News 4 in the Bay Area. There will be no testimony today or Friday. The hearing is scheduled to resume Tuesday, May 26. UPDATED 5/20/2009: Defense For Mehserle Predictably Presents The “He Was Going For His Taser” Defense. This has been expected all along from everybody who’s been paying attention. The defense may have screwed themselves a little in trying to get the murder charge reduced to manslaughter or dismissed completely. The defense called their first witness, Dennis Zafiratos, who said he saw Mr. Oscar Grant fighting with another passenger on the train, David Horowitz. But Horowitz testified he did not fight with Grant that night. Terrorist Mehserle’s lead attorney, Michael Rains, said that Mr. Grant was “actively, actively resisting arrest,” even though video and several prosecution witnesses said otherwise. Rains will call several BART cops to the stand for testimony this week and next. Protestors gathered for the third straight day, demanding terrorist Mehserle be tried for murder. 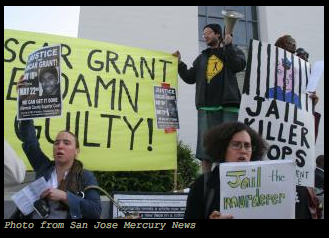 OAKLAND, CA — Day 2 in the preliminary hearing of terrorist Johannes Mehserle, the Bay Area Transit cop who murdered 22-year-old Oscar Grant on New Year’s Eve, ended with the prosecution resting its case after presenting new evidence to the court. Prosecutors will continue to pursue murder charges against the American terrorist, but it is becoming increasingly likely, because this is the United States, Mehserle will escape with involuntary manslaughter charges. The prosecution brought nine witnesses, including Mr. Grant’s friend, Jamal Dewars, who testified Grant had been in a “scuffle” earlier in the night. Another witness, Tommy Cross, presented new video of the incident which has not been circulated on the internet as many of the others have. It is said that this video has the best view of what happened. Protesters, for a second straight day, were present near the Oakland courthouse, demanding the murder charges stick and that terrorist Mehserle is prosecuted to the fullest extent of the law. The defense for the domestic terrorist will continue to push that Mehserle was “going for his Taser,” not his gun, and meant to Taser Grant, and not shoot him. They will also focus on the testimony of Cross, saying Mehserle said, “oh my god, oh my god” after murdering Mr. Grant. Cross, however, also said he thought excessive force was used. This case reminds me of the Rodney King case and will likely turn out the same way. There was no need for a trial in King’s case, as video footage showed, beyond a reasonable doubt, those Los Angeles police thugs beating a man who was unarmed and down on his hands and knees. The sick, twisted truth to all this is, Mehserle will not be charged with murder and will likely be acquitted of all charges. This is the United States, and this country simply does not punish thug cops for murdering, assaulting, and/or maliciously manipulating the lives of “blacks.” There cannot be any better evidence that this case is nothing more than a trigger-happy, inbred Euro who viewed Mr. Grant as a “black” animal. Sure, Euro-American media and many Euro-Americans will continue their declarations that “blacks exaggerate about police brutality,” “racism is over with Obama’s election,” and “blacks exaggerate the extent of racism” in the USA. The San Francisco Bay View newspaper wrote an article a few days after the murder, anticipating and completely debunking the ridiculous, and frankly insulting, defense of “accidentally using his gun instead of his Taser.” Its simple: Tasers weigh almost a pound less than a Glock 36 (the guns that BART cops use), Tasers look and feel completely different than a Glock, and the safety for a Taser is on the handle, while the safety on this particular Glock is on the trigger itself. Just as Operation Nation correctly predicted “white chick justice” in that infamous beating in Florida back in April of 2007; the way this country works, in rewarding cops for thug behavior towards “blacks,” Mehserle will either be acquitted of all charges or be convicted of involuntary manslaughter and not serve another day in jail, as he’ll get sentenced to probation. We will provide daily updates as this preliminary hearing progresses.